"Experts from both Governments have taken further measurements of the current electro-magnetic emissions at the site. It is clear from these measurements that emissions are well within the EU parameters established as not posing a risk to health. The two Governments have reiterated their commitment to conduct a joint long-term medical research study in the area in order to respond to the concerns of local residents. - A review of the environmental impact assessments prepared for the British Ministry of Defence and observations of the Cyprus Ministry of Agriculture, relating to the environmental impact, by a respected independent, transparent and international panel of reputable experts with relevant experience. The panel would consider the issue in a holistic manner, and give an informed opinion. - A commitment to cooperate in producing an environmental management strategy for the Salt Lake site, including the creation of a fully protected nature reserve in the Salt Lake area.
] the 1971 Ramsar Convention on Wetlands of International Importance especially as Waterfowl Habitat, to the Sovereign Base Areas, and to designate the Akrotiri Salt Lake for inclusion in the List of Wetlands of International Importance, as provided for in Article 2.1 of the Ramsar Convention. - A joint programme will be established to monitor bird movements during the winter period and the period of reproduction and migration over the area. The outcome of the environmental review will be shared between the two Governments." On 19 June 2002, the Cyprus Green Party organised a seminar on the Akrotiri wetland complex and on issues related to the many antennas, already installed or planned, inside this area, close to Akrotiri village and the Royal Air Force base. The Ramsar Bureau was invited to participate in this seminar together with a dozen or so speakers from Cyprus and Greece. The presentations covered issues such as electro-magnetic radiation effects on human health and safety limits, legal aspects of technological systems affecting the environment, the Ramsar Convention on Wetlands and the Council of Europe Landscape Convention, wetland restoration as a means for the preservation of water resources, the special characteristics of the Akrotiri wetland complex: its geology, hydrology, ecosystems, vegetation, fauna and birds, and the archaeological sites on the Akrotiri peninsula. The seminar brought together local stakeholders and elected people (at national and local level), NGOs, scientists, legal experts, Cypriot civil servants, and representatives of the Sovereign Base Administration Authority. The 60 or so participants had fruitful exchanges of views and interesting discussions. The organisers of the seminar have to be congratulated for a very substantive and well organised meeting. The Ramsar Bureau took the opportunity of this invitation to visit also the Environment Service of the Ministry of Agriculture, Natural Resources and the Environment, i.e. the Ramsar Administrative Authority of the Republic of Cyprus (the country joined the Convention in 2001 as Europe's most recent Contracting Party). In addition, the Green Party also arranged meetings with different personalities (cf. list below), in part at very short notice. In this way, the Ramsar Bureau was able to obtain a first-hand impression of the view of the most important stakeholders concerned by the Akrotiri case: the UK Sovereign Base Administration Authority, the Cyprus Government and Parliament, the Akrotiri Municipality, different individuals, and NGOs. This mission report should be considered as a note for those concerned with wetland conservation issues, recalling the specific views of the Ramsar Bureau. It is hoped that this may provide some help for the different partners in Cyprus to find the best possible solutions for the problems evoked. To this end, a number of points are listed below that concern priorities in view of the wise use and conservation of the Akrotiri wetland complex, as advocated by the Ramsar Convention. 1. All stakeholders agreed on the outstanding ecological and biodiversity value of the Akrotiri wetland complex. The site is one of the major few wetland ecosystems on the island of Cyprus. It qualifies for listing as a Wetland of International Importance under the Ramsar Convention Criteria 1, 2, 3 and 6. An impressive amount of interdisciplinary knowledge and data is available to substantiate this claim. 2. At landscape scale, the Akrotiri wetland complex is an aquatic ecosystem consisting of several interconnected parts: the Akrotiri salt lake, the Phasouri marshes (reedbeds and surrounding wet grasslands), flat open and shrub habitats and salt marshes connecting the Phasouri marshes and the Akrotiri salt lake, as well as the adjacent coastal areas of the tombolo beaches: shingle on the western shore and sand on the eastern shore. For wetland management purposes, functional links with the rest of the water catchment basin, mainly linked to Kouris river and dam, as well as the temporary links with the Mediterranean Sea, need to be taken into account. 3. The commitment of the UK Government to extend its application of the Ramsar Convention to the Sovereign Base Areas and to designate the Akrotiri wetland as a Wetland of International Importance, as notified in the joint statement with the Republic of Cyprus in August 2001, has to be applauded. 4. The Convention on Wetlands provides the legal framework for a coordinated approach to the conservation and wise use of the Akrotiri wetland complex by the Governments of the UK and Cyprus, according to Article 5, which states that "The Contracting Parties shall consult with each other about implementing obligations arising from the Convention especially in the case of a wetland extending over the territories of more than one Contracting Party or where a water system is shared by Contracting Parties. They shall at the same time endeavour to coordinate and support present and future policies and regulations concerning the conservation of wetlands and their flora and fauna." 5. An international Panel of independent experts conducted a thorough and detailed review of the original impact assessment regarding the construction of new large antenna (report 1 listed below). They identified deficiencies and requested additional information to be provided through supplementary work. This work was undertaken (reports 2-4 listed below), focusing on the priority areas identified by the Panel. Most recently, the Panel issued a preliminary statement on this supplementary work, pending a more detailed review of its technical appendices (report 5 listed below). It can therefore safely be stated that the procedures under way are in accordance with Ramsar Resolution VII.16 "The Ramsar Convention and impact assessment: strategic, environmental and social" and Draft Resolution VIII.9, to be discussed by the Contracting Parties during COP8 in November 2002 providing "Guidelines for incorporating biodiversity-related issues into environmental impact assessment legislation and/or processes and in strategic environmental assessment adopted by the Convention on Biological Diversity (CBD), and their relevance to the Ramsar Convention". 6. It is strongly suggested that the UK and Cyprus continue their efforts of efficient cooperation, according to Article 5 of the Ramsar Convention, including the development of a common proposal for the designation of the Akrotiri wetland complex as a Ramsar site, together with an environmental management strategy and an operational management plan for the entire wetland complex. During the Ramsar Bureau visit, it was apparent that more regular and more structured communication and collaboration between the Cyprus Ministry of Agriculture, Natural Resources and the Environment and the Sovereign Base Area Administration would be beneficial to this end. 7. It has to be noted that the existing antennae, and even more so the planned additional one (Pluto 2), are situated in a crucial and sensitive area of the wetland complex, providing the hydrological link between the Phasouri marshes and the Akrotiri salt lake, as well as specific habitat for species of particular concern. The expert Panel outlined the actual and potential problems in this area (cf. report 1 listed below). Since then, mitigation and compensation measures were proposed (cf. report 4 listed below). It is therefore a high priority to mitigate for damages that occurred in the past when the existing antennae were constructed, and to compensate for potential new damages, if the additional antenna is to be built. Probably, the Panel will still outline more specific needs, pending its analysis of the technical appendices of the supplementary work. To maintain the ecological character of this wetland complex, it is crucial to restore the water runoff capacity between Phasouri marsh and the salt lake. It is also essential to maintain sufficient habitat for the species identified as of special concern, and to monitor the success of such efforts in terms of their population sizes. 8. In the medium term, and with the possible advent of new technology, it will be preferable to move all antenna installations outside of the wetland area (as described under point 2). 9. The Ramsar Bureau had access to two proposals for Ramsar Site delineation, one by the Cyprus Government following, in essence, the wetland ecosystem delineation provided under point 2 above, and a proposal by the Sovereign Base Area Administration that proposes a more restrictive Ramsar Site, separated in two, somehow artificially delineated entities. The UK approach seems to mirror established practice of Ramsar Site delineation in Britain (and some other countries), restricting Ramsar Sites to core areas of wetland ecosystems, normally benefiting from a strict protection status. It would seem that, at least in England and Wales, sufficient legislation exists to prevent negative influences to such Ramsar Sites from bordering areas (e.g. through agricultural or urban water runoffs). However, given the transboundary situation of the Akrotiri wetland catchment (the upper part lying in the Republic of Cyprus), the legal situation regarding the Akrotiri wetland complex may not be as safe. 10. It would appear that these differing views have created some hindrance between the British and Cypriot partners. This need not to be so, as both proposals could easily be combined. Ramsar Resolution VII.11 and its annex provide a "Strategic Framework and guidelines for the future development of the List of Wetlands of International Importance" and Paragraph 46 of Ramsar Handbook 7 states: "Boundary definition of sites. When designating sites, Contracting Parties are encouraged to take a management-oriented approach to determining boundaries, recognizing that these should allow management of the site to be undertaken at the appropriate scale for maintaining the ecological character of the wetland." To this end, it seems perfectly feasible to delineate the Ramsar Site according to the ecologically inspired proposal of the Cyprus Government, while including the British proposal as the Site's strictly protected core zone. Paragraph 49 of Ramsar Handbook 7 states that "In determining boundaries of Ramsar Sites, particular attention should be given to ensuring that wherever possible the limits of the sites serve to protect them from potentially damaging activities, especially those likely to cause hydrological disturbance. Ideally, boundaries should include those areas of land necessary to provide and maintain the hydrological functions needed to conserve the international importance and integrity of the site. 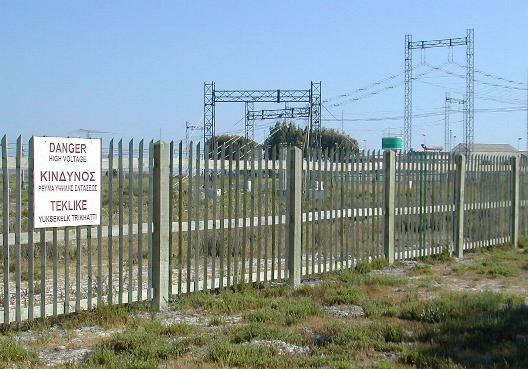 Alternatively, it is important that planning processes are operating to ensure that potential negative impacts arising from land-use practices on adjoining land or within the drainage basin are suitably regulated and monitored to provide confidence that the ecological character of the Ramsar Site will not be compromised." 11. In this context, the public statement by the Sovereign Base Area Administration that the area provisionally indicated for Ramsar Site designation "will not be subject in the future to military development", that "existing British facilities in the salt lake area will be managed to ensure that any significant new impacts on the Ramsar Site or other important conservation features in the area will be avoided", and that the "British Forces Cyprus will work to restore as much as possible of the habitat within the antenna farms to a favourable, natural condition" (press conference on 11 June 2002), provides a crucial and laudable commitment. b. A Nature Reserve, designated under the Forests Ordinance, which will initially comprise all areas of the Ramsar Site which are currently Crown Forest land. Detailed requirements for the regulation of the Nature Reserve will be drawn from the Environmental Management Plan. c. White Zoning of all other areas of the Ramsar Site under the Protection of the Environment Ordinance, which will help ensure that development is strictly controlled. Similar controls are likely to be required in a number of other areas adjacent to the Ramsar Site in order to meet the requirements of the Environment Management Plan." 13. Independently of the final delineation of the Ramsar Site (and the extent of its potential core and buffer zones), this clearly states a firm commitment for wise use of the entire wetland complex area through the means of an integrated management plan. The British and Cypriot authorities are strongly encouraged to continue their cooperation along these lines. 14. Furthermore, the sustainable management of the Akrotiri wetland complex will also place obligations on the Republic of Cyprus and other stakeholders outside of the Sovereign Base Area, because many activities that influence the wetland complex are not within the direct control and influence of the Sovereign Base Area Administration. This includes issues such as not developing sites in and around the wetland complex area that could adversely affect the integrity of the site, developing a further understanding of the hydrogeological system (ground and surface waters) of the wetland complex, restoring the degraded flooding regime of the Phasouri marshes (as a consequence of the construction of the Kouris dam) in order to maintain the habitats for wild species of conservation concern, grazing of domestic herbivores and sustainable exploitation of reeds, and preparing an integrated management strategy for replacement of the plantations of exotic trees (Eucalyptus and Acacia) consuming large amounts of groundwater along the northern border of the salt lake. 15. The Environmental Management Strategy will also have to address issues of access to the protected areas, notably by off-road vehicles. Fauna wardens may be a solution to reduce disturbance to wildlife, including sea turtles using the SW beach area. As discussed with the Akrotiri Municipal Council, the designation of the Akrotiri wetland complex as a Wetland of International Importance will put the site on the map and increase international awareness about its natural and cultural values. This may lead to specialised tourist activities, bring additional visitors to the area and create economic opportunities for inhabitants of the commune. I would like to express my sincerest thanks to Elpida Shoukris and her colleagues for arranging the different meetings, to those personalities who received me for their openness in discussing the issues at stake, and to the Cyprus Green Party and the representatives of different NGOs for their great hospitality during the days I spent in Cyprus. Monday 17 June: Travel to Cyprus and discussion over dinner with George Perdikes (MP Green Party), Myroula Hadjichristophorou (Ramsar AA), her husband Andreas Demetropoulos (formerly with the Ministry of Agriculture, Natural Resources and the Environment), and Antonía Theodosiou (President of the Federation of the Environmental and Ecological Organisations of Cyprus), overnight in Lefkosía (Nicosía). Tuesday 18 June: Meetings with the Parliamentary Environment Committee, chaired by George Lillikas, with the Minister of Foreign Affairs, Yiannakis Casoulides, and with Myroula Hadjichristophorou and Antonis Antoniou of the Environment Service of the Cyprus Ministry of Agriculture, Natural Resources and the Environment; then transfer to Lemesos (Limassol), brief visit of the Phasouri marshes, the antenna installation site, the Akrotiri salt lake and the tombolo beaches of the Akrotiri peninsula. Wednesday 19 June: Participation in the Green Party seminar "S.O.S. Akrotiri wetland complex" at the cultural centre of the Hellenic Bank in Limassol, next to the Akrotiri peninsula, with translations into English provided to me by two interpreters. Thursday 20 June: Meeting at the Akrotiri Area Office of the Sovereign Base Administration Authority with Christakis Athanasiou (Area Officer) and Pantelis Charilaou (Environment Officer), media conference at the office of the Green Party in Limassol, discussion with the President and several members of the Akrotiri Municipal Council, including representatives of the Akrotiri Environmental Club, discussion over dinner with Daphnis Panayidis (Vice-President of the Federation of Environmental and Ecological Organisations of Cyprus) and friends. Friday 21 June: Return to the Ramsar Bureau offices at Gland, Switzerland. CEAM, Institute of Environmental Management & Assessment, Lincoln, UK, 67p. 2) May 2002: Assessment of off-site environmental effects and socio-economic impacts of Project Pluto; Defence Estates Sustainability and Environmental Advisory Team and Sovereign Base Area Administration - Area Office, version 1.0, 79p. 3) May 2002: Proposed Antennae Development, Salt Lake, The British Sovereign Base at Akrotiri, Cyprus, Archaeological Desk-based Study, Geophysical and Geological Assessment; Wessex Archaeology, UK, 46p. 4) 7 June 2002: Project Pluto, Supplementary Environmental Work, Final Report; Defence Estates, 69p. 5) 14 June 2002: Review of Additional Assessment Reports on Project Pluto (Proposed Antennae Development), British Sovereign Base Area, Akrotiri, Cyprus, Statement of the Independent Panel; CEAM, Institute of Environmental Management & Assessment, Lincoln, UK, 20p. This study presents a preliminary statement by the panel that elaborated document 1 (above) on the additional assessment work called for there, pending more detailed review of the technical appendices of report 4 (above). The panel proposes to conduct this review in relation to monitoring and management of the construction and in the event that Project Pluto is approved and construction proceeds. 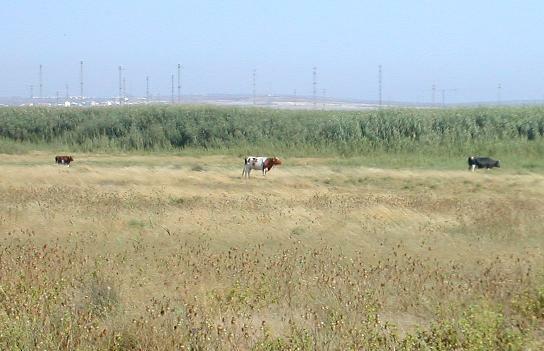 Photos: Phasouri grazing marshes with antenna installations, contested by Cypriot opponents, in the background.